Very good product. Nice that you can wall mount. Improve your upper-body workout with this vinyl-coated dumbbell set with rack from Dycem. 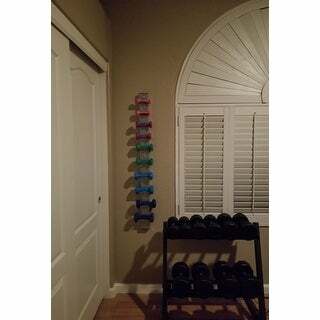 This is a great inexpensive set if you're wanting something basic with a little a bit of color to a fitness room. I would recommend this product to family and friends. The fact this came with a rack was the deciding factor. So great to have storage for hand weights instead of stubbing toe or tripping over them on the floor. Great organization and looks cool on wall too, like bonus artwork! Excellent addition to my weight room. We needed to add reinforcement studs because it's a bit heavy. These colorful little guys are convenient and fit snugly in the corner of the room. They're great to use while on the treadmill or stationary bike or just grabbing them on the way out the door to jog or power walk. "How tall is the wall rack?" This wall rack is 4 feet tall. 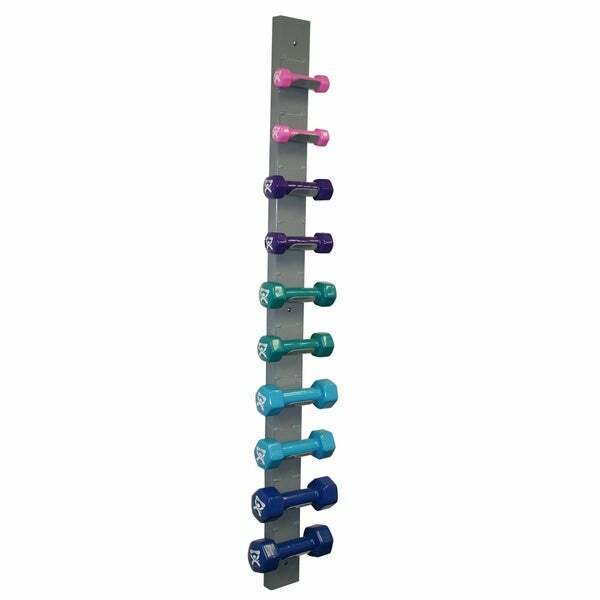 "does this rack hang on the wall? and does it come in the gray/silver as shown?" Thank you for contacting us adjuka1. This unit does hang on the wall. There are 3 screws included for assembly. The rack is made of steel and is gray Please let us know if you have any further questions. Hello adjuka1, This dumbbell set and rack is a great way to get in shape! This unit is a wall rack, so it does hang. It will arrive as pictured. I hope this information helps. Thanks for shopping with us. For any woman who is constantly on the move and feels best after a good workout, these fitness accessories make great Christmas gifts. From running shoes for the track star to yoga mats for the yogi, here you will find the perfect gift for any athlete. Keep reading to learn how you can make her Christmas special with fitness equipment. Whether you are shopping for your sister, best friend, or girlfriend, a thoughtful gift that enhances her healthy lifestyle will be well received. From the yogi to the CrossFit guru, this list will help you put something under the tree for every kind of fitness fanatic on your list. Exercise Equipment Buying Guide from Overstock.com. You'll stay motivated to work out regularly starts when you know how to find the exercise equipment that's right for you.